Preprints (earlier versions) of this paper are available at http://preprints.jmir.org/preprint/11138, first published Jun 05, 2018. Background: Smoking cessation interventions delivered through social media have the potential to engage young people in behavior change. Objective: The aim of this study was to describe participant-posted messages in a Facebook smoking cessation intervention for young adults to discern support for behavior change. Methods: We qualitatively analyzed data from the treatment arm of a randomized trial testing the efficacy of the Tobacco Status Project Facebook intervention. Young adults (N=138) aged 18-25 years (female: 81/138, 58.7%; white: 101/138, 73.2%; mean age 21 years) were recruited using Facebook and placed into one of the 15 secret Facebook groups based on readiness-to-quit smoking. Messages posted to groups for 90 consecutive days were tailored to readiness-to-quit: Not Ready (46/138, 33.3%), Thinking (66/138, 47.8%), and Getting Ready (26/138, 18.8%). Groups were randomized to receive up to US $90 for posting or no incentive. Two independent coders conducted open coding of user posts. We considered content by readiness-to-quit group and incentive condition. Results: There were 4 dominant themes across all groups: coping skills, friends and family, motivation to quit, and benefits of quitting. The dominant themes in Not Ready groups were friends and family (incentive) and motivation to quit (no incentive), whereas coping skills was the dominant theme in Thinking and Getting Ready groups. The expression of themes varied by readiness-to-quit group but not by incentive condition. Conclusions: Intervention messages tailored to readiness-to-quit appear useful in eliciting the desired responses from young adult smokers, with limited influence by monetary incentive. Nearly all smokers (98%) begin smoking in adolescence and young adulthood (before the age of 26 years) . Despite being just as motivated to quit as other adults and the wide availability of evidence-based smoking cessation interventions including quit lines, counseling, and medication, young adults are less likely to use these strategies to quit smoking than adults of other ages [1-4]. While emerging evidence shows that Web-based smoking cessation interventions have high user satisfaction and are effective for adults [5-7], among younger adults’ adherence to and engagement in online smoking cessation interventions remains low [8-11]. Still, with extremely wide use among young adults (88% of Americans aged 18-29 years in 2016) , Facebook may serve as an engaging tool, with broad reach, to deliver evidence-based smoking cessation interventions to this population. Most research analyzing the content of digital interventions for smoking cessation has focused on quantitative analyses of data from online cessation communities (eg, volume or timing of posting). Across cross-sectional and longitudinal studies, participant engagement with digital interventions is associated with and predictive of smoking cessation [7,13-18]. Online smoking cessation communities have also been evaluated using social network analysis, a tool that helps describe the patterns of social relationships that form between groups and individuals . Social network analysis revealed that the online smoking cessation community QuitNet has the characteristics necessary to sustain the support and promotion of cessation and that Facebook interactions were centralized, with a small number of users (“superusers”) leading the communications  and that demographic characteristics and posting behavior were similar across free public and private Web-assisted smoking cessation communities [20,21]. There is a smaller literature using qualitative methods to analyze the content of online and social media-based smoking cessation interventions. Computer-driven techniques (eg, latent Dirichlet allocation, correlated topic modeling) have been used to analyze social media data and offer advantages over human coding in analyzing large datasets [22,23]. One report identified concepts and themes in peer-to-peer messages on QuitNet to discern which themes were associated with abstinence. Investigators identified 12 themes comprising 43 concepts and found that abstinence was associated with interpersonal themes such as social support and cessation progress . Another study described the content of “first-posts” by members of StopSmokingCenter.net to determine what content garnered a response-post and found that problems with quit attempts received a response the most often . A study using framework analysis to characterize the content of posts to the Facebook page of Crush the Crave, an intervention aimed at young adults, found that the main purpose of participant posts was cessation support and identified 7 subthemes: management of cravings, promoting social support, denormalizing smoking, providing health information, encouraging cessation, exposing tobacco industry tactics, and group stimulation . By facilitating change talk and conversations about change and abstinence, social media-based cessation interventions have the potential to support the change process; however, it is not yet understood if this is so. Nevertheless, the text-based nature of social media interventions offers a unique opportunity to characterize the representations of smoking and the change process across the stages of change. Our group developed the Tobacco Status Project (TSP) smoking cessation intervention delivered entirely through Facebook. Results from the randomized controlled trial (RCT) evaluating TSP showed significantly greater biochemically verified abstinence from smoking at treatment end in those who received the intervention (8.3%) than in those who received referral to the National Cancer Institute Smokefree.gov website: 3.2%, odds ratio 2.52 (95% CI 1.56-4.04), P<.001 . There were no 12-month treatment effects for reported abstinence (P=.74), reduction in smoking by ≥50% (P=.53), likelihood of having made a quit attempt (P=.39), or stage of change over time (P=.97); retention was 71%. Participants in TSP engaged more and rated the intervention more favorably than those in the control condition. Until now, there have been no qualitative reports on the content of participant posts in smoking cessation interventions embedded entirely within social media (ie, Facebook) and findings could be used to maximize the effectiveness of intervention messages within the context of social media smoking cessation interventions. In this study, we examined the overall content of participant-generated posts from the RCT testing the effectiveness of TSP and identified recurrent themes within the 3 readiness-to-quit groups and across the incentive condition. We have used specific quotes to illustrate the nature of frequent themes in each group. Data derived from the treatment arm of an RCT testing the efficacy of TSP is described elsewhere [27,28]. Young adults aged 18-25 years, residing in the United States, who had smoked ≥100 lifetime cigarettes, and who smoked ≥3 cigarettes per week were eligible and were recruited using Facebook ads . Informed consent to participate was obtained online through the study website. Three multiple choice questions confirmed the understanding of study risks; identity was verified by email or social media; and then the online baseline assessment link was emailed [27,28]. Participants were randomized to either the treatment condition (TSP) or the control condition (referral to the National Cancer Institute Smokefree.gov website). Within the TSP condition, participants were assigned to a private Facebook group based on and tailored to their readiness-to-quit smoking at enrollment (precontemplation: “Not Ready”; contemplation: “Thinking”; preparation: “Getting Ready”); participants were assessed using the Stages of Change Questionnaire . Groups began on a rolling basis starting when the first participant had been waiting no longer than 2 weeks; thus, group size varied. Groups were open for the duration of the trial (12 months), although content was only generated by the study team for the first 3 months. Table 1. Study sample characteristics (N=138) from Tobacco Status Project, a smoking cessation intervention delivered entirely through Facebook. At the group level, participants were randomized to receive a monetary incentive (daily, weekly, or monthly) for commenting on intervention Facebook posts (up to $90) or no incentive. The participant pool for this study included all participants assigned to receive no incentive and those assigned to receive a monthly incentive (N=138), and the majority were white (102/138, 74.0%) and female (84/138, 60.0%; see Table 1 for detailed demographics and smoking characteristics). Participants received 90 consecutive daily intervention posts (see Multimedia Appendix 1 for sample intervention posts) and “live” weekly one-hour counseling sessions during which a counselor, using Facebook commenting features, could answer participant questions in real time; and for those in the preparation stage of change at baseline, 7 state-of-the-art group cognitive-behavioral sessions were delivered through private Facebook groups. Intervention posts, including textual content, were designed and agreed upon before the study launch; dispatch of these posts was automated throughout the intervention according to the schedule. Trained intervention staff monitored the groups daily for any inappropriate content in responses to intervention posts. Additionally, doctoral-level trained smoking cessation counselors facilitated live weekly counseling sessions. Participants remained in the same group throughout the 3-month intervention. Daily posts employed the aspects of motivational interviewing, cognitive behavioral therapy coping skills, and the transtheoretical model (TTM) [29-31]. Posts to Not Ready groups were designed to enhance motivation and the importance of quitting, as well as to identify problems related to smoking. Posts to Thinking groups emphasized challenging the cons to change, the benefits of quitting, and TTM processes of change including consciousness-raising (learning new facts, ideas, and tips that support the behavior change), and making a small commitment to change. Posts to Getting Ready groups provided strategies for long-term smoking cessation together with making a commitment to quit, including setting a quit date and making a detailed plan for quitting, removing smoking paraphernalia from the home, and engaging in alternative behaviors. All posts included an image with text designed to elicit a response from participants (Multimedia Appendix 1). First, data were downloaded from the Facebook app program interface, which was accomplished using “tools” from Facebook’s API Explorer. Data extraction included use of Facebook “access tokens,” which allowed study personnel to extract textual data from selected fields (all fields containing textual data were selected) within each group. Next, these data were provided to coders in a spreadsheet form with columns representing chosen fields. Next, two coders independently identified themes in transcripts using inductive or “open” coding. Open coding is data driven, that is, codes are based in the data (a “bottom-up” approach) rather than a theory-driven (“top-down”) one . Investigators met after each transcript was coded to compare themes, resolve any discrepancies, and refine codes or themes. When it was agreed that thematic saturation had been reached (no emergent codes), a codebook containing identified codes was agreed upon. Thematic analysis  was conducted first among all data then by readiness-to-quit group and incentive condition. Thematic “prevalence” (defined as the number of posts containing a particular theme) was calculated to account for differences in group size (number of participants) to identify and interpret dominant themes. Themes were described and patterns of themes within the data were examined and summarized to interpret their broader meanings and associated implications. All analyses were performed using Dedoose version 7.5.14 (SocioCultural Research Consultants, Los Angeles, CA, US) or Excel 2013 (Microsoft Corporation, Redmond, WA, US) . The 35 themes common to all groups are represented in Textbox 1. 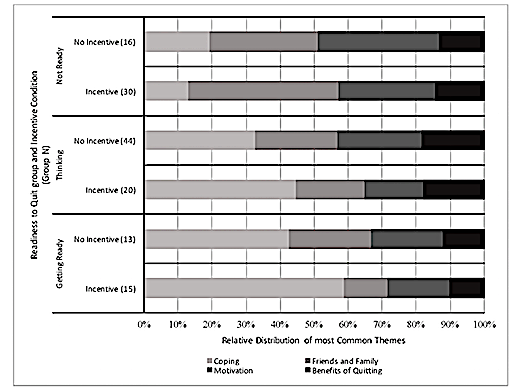 Four themes were most prevalent (“dominant themes”) across all readiness-to-quit groups and incentive conditions: (1) coping; (2) friends and family; (3) motivation; and (4) benefits of quitting. Within each readiness-to-quit group, differences in the frequency of themes varied negligibly by the incentive condition (Figure 1). The dominant themes in the Not Ready groups were friends and family in the incentive condition and motivation in the no incentive condition. The dominant theme for Thinking and Getting Ready groups was coping across incentive conditions. An examination of theme content across incentive conditions in all groups showed little variation by incentive, and thus, expression of codes was interpreted by theme and readiness-to-quit, rather than by incentive. In response to any intervention content, 2517 posts (µ=503) were made in the Not Ready groups, 1687 in the Thinking groups (µ=281), and 1943 in the Getting Ready groups (µ=486), totaling 6147 comments with a mean of 423 comments per group. The average number of comments did not differ between the Not Ready and Getting Ready groups (independent sample t7=0.15, P=.89), Not Ready and Thinking groups (t9=1.56, P=.15), and Getting Ready and Thinking groups (t8=1.37, P=.21). Likewise, the average number of comments did not differ by incentive condition within Not Ready groups (t3=1.06, P=.37), Thinking groups (t4=0.09, P=.93), and Getting Ready groups (t2=0.88, P=.47). I can't think of something that would help me, except eating. Textbox 1. The top 35 themes identified in the Tobacco Status Project. Figure 1. Dominant themes by readiness-to-quit group and incentive conditions from the Tobacco Status Project. Fill your free time with activities such as learning a new skill. Its [sic] hard to think about smoking when you’re immersed in concentration. Walk with two drinks in my hand. Can't hold a cigarette if your [sic] holding two drinks right?! I'm worried about being mean to those I love. Posts generally reflected ambivalence, consistent with “contemplating” quitting. My support system was excited, skeptical but happy that I'll be quitting. A few said I won't quit and it won't last. My girlfriend hasn’t helped much considering she asks me if I wanna [sic] smoke one when she gets home everyday [sic]. It's a horrible habit and I want to quit. For health reasons alone! My dogs honestly! Lol everyone in this house smokes except them, and they can't exactly crack the window now can they? I think about my friends that don't smoke and my little cousins. I want to be able to run faster for longer. I want to be dependent on nothing. I want to make my Dad proud. My lung capacity. Not coughing up stuff. ...then I coughed up blood. Nope. I’ve been going to the gym 3 times a week! My health. My health. My health. Probably be healthier. Feel better throughout my day. I would lose dependency on an item when I'm stressed or hurt and could actually face what was causing those feelings right away. And I would save so much money. Everything will be better! My teeth, my breathing, my health in general, my wallet, and just feeling great about myself knowing that nicotine doesn't control me anymore!!! I will definitely feel my stamina come back when i [sic] quit. I love to run and play soccer. No smoke smell on my clothes. To begin to understand how social media-based interventions may support behavior change (ie, quitting smoking), we examined the content and volume of participant posts from TSP, a smoking cessation intervention for young adults delivered entirely through Facebook. We identified dominant themes throughout by readiness-to-quit group and by monetary incentive for engagement. There were slight variations in the content expressed in groups across readiness-to-quit and incentive conditions, and young adult smokers were most likely to post content related to motivation to quit, coping strategies, exploring relationships with friends and family members in the context of quitting, and exploring the benefits of cessation in all groups. These topics are consistent with the overall intention of the TSP intervention to enhance motivation, support change talk, and promote the use of coping strategies for cessation. While all 3 readiness-to-quit groups across incentive conditions had the same 4 dominant themes, how these themes manifested in each group was quite different. Consistent with stage-matched intervention theory and the tailored content within intervention posts, participant posts in the Not Ready groups were related to raising doubt about continuing to smoke and enhancing motivation through values evaluation. In more motivated groups, participant posts were more focused on strategies for coping with quitting (eg, changing behaviors to ameliorate effects of withdrawal) and less on motivation. Findings show that participant behavior in the context of private social media groups is consistent with the intent of in-person smoking cessation interventions tailored to readiness-to-quit smoking and support online delivery of such tailored interventions. Across incentive conditions and themes, those in Not Ready groups reiterated their unwillingness to quit smoking now. Posts in the Not Ready groups consistently contained qualifier words such as “if,” “but,” “might,” “maybe,” and “sometimes” when responding to intervention posts suggesting possible ways to change their smoking behavior. This is consistent with a hesitant stance favoring no change and speaks about the importance of using motivational interviewing techniques such as expressing empathy and rolling with resistance, even in the context of social media posts . The posts with content coded “family and friends” also typically contained content coded “motivation” in the Not Ready groups, which contextually suggested that focusing on family and friends may function as a barrier to change for participants not ready to quit. Content emphasizing the availability of social support through a social media smoking cessation intervention may be particularly effective for this group . While participants in the Thinking groups shared their experiences of past quit attempts and indicated in their posts that they would be willing to try new behaviors, posts for this group had an ambivalent tone overall. Indeed, it is this ambivalence that can keep individuals stuck in this stage for long periods of time . Furthermore, just as these participants posted about how they felt smoking had affected the people in their lives, they tended to focus on how quitting could benefit these people (versus themselves). This external focus could also be an indication that smokers in contemplation have yet to internalize the benefits of quitting for themselves . Still, many Thinking posts referred to participants’ wish to be free from nicotine dependence; targeting this group with messaging focused on freedom from addiction could aid in moving them toward action (quitting). Posts in the Getting Ready groups were emphatic and permeated by levity. For example, posts evidenced doubt among participants’ social groups that they would be successful in quitting. These misgivings were addressed pragmatically and with humor by participants and seemed to have motivated rather than discouraged participants in their efforts to quit. Furthermore, posts indicated that participants were internally focused: they described actions they were already taking and posted about how better they felt and how they would feel upon successfully quitting, indicating perceived self-efficacy, which is a necessary component of successful behavior change [37-39]. The usefulness of tailored TSP posts to this group is exemplified by participants’ drive to stay the course of abstinence to achieve freedom from dependence. Employing the same or similar messaging in future social media interventions for young adults is warranted. There were only negligible differences in dominant themes between incentive conditions, suggesting that the content was not altered by the presence of a monetary incentive tied to engagement. This finding supports the literature suggesting that incentives do not undermine participants’ intrinsic motivation to change health behaviors; unlike other behaviors, which have shown an undermining effect of incentives . In the TSP-evaluating RCT, incentives were found to be related to comment volume in contemplation (χ2=14.59, df=2, P=.002) and preparation (χ2=9.95, df=2, P=.02) but not precontemplation (χ2=6.80, df=2, P=.08), suggesting that there is some promise for using monetary incentive to increase the number of participant posts in social media-based smoking cessation trials without an associated impact on quality . Limited differences in the expression of common themes in Not Ready and Thinking groups suggest that content could potentially be merged in future interventions. The themes identified in participant comments were guided in part by the content of the posts themselves. However, given the nascent literature on behavior in social media intervention, it was not clear whether the content would be germane to the intervention. Participant posts from The Doctor Is In sessions were not investigated independently of daily intervention posts. The results of our analysis of data from a Facebook intervention for young adult smokers may not generalize to other social media platforms (eg, Instagram), user profiles (eg, older adults), or health risk behaviors. Overall, tailored messaging delivered through a social media smoking cessation intervention appears to support content reflective of the theories driving the intervention across all stages. As social media continues to be a resource for engaging young adults in healthy behavior change, qualitative analyses can inform treatment targets and show that tailoring interventions to readiness to change is likely an ideal strategy for enhancing motivation and supporting behavior change. DR has consulted with Carrot Sense, which makes a tobacco cessation device. KM has no conflicts of interest. Sample intervention and participant posts from each of the four most common themes across readiness-to-quit groups in the Tobacco Status Project. Shahab L, McEwen A. Online support for smoking cessation: a systematic review of the literature. Addiction 2009;104(11):a.
Scott J. Social Network Analysis. Thousand Oaks, CA: SAGE Publications Ltd; 2017. Yang S. A comparative study of smoking cessation intervention programs on social media. In: Social Computing, Behavioral-Cultural Modeling and Prediction. Berlin: Springer-Verlag; 2012. Patton M. Qualitative evaluation and research methods. In: Qualitative evaluation and research methods (2nd ed.). Thousand Oaks, CA: SAGE Publications, Inc; 1990. Naar-King S, Suarez M. Motivational interviewing with adolescents and young adults. New York, NY: Guilford Press; 2011. ©Karma McKelvey, Danielle Ramo. Originally published in JMIR Formative Research (http://formative.jmir.org), 04.09.2018.